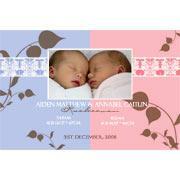 Photo Cards for Twins or Triplets Birth Announcements and Baby Thank-you Cards are an easy, affordable and classic way to announce the arrival of your babies. 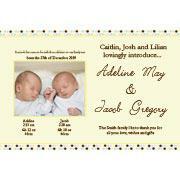 Take the time and hassel out of organising announcement cards and photos by ordering one of these creative birth announcement photo cards and baby thank you cards. 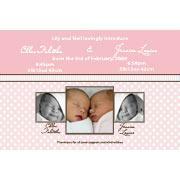 Hassel free, quick and easy check out means that designing and receiving your birth announcement is both quick and efficient leaving you precious time to spend with your new bundles of joy. 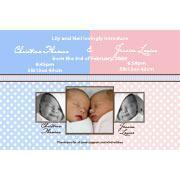 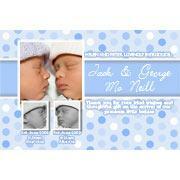 You will receive your birth announcements photo cards proof in minimal time. 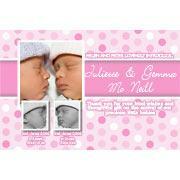 The only hard task is choosing which of the creative and unique birth announcements photo card you like.